Jonathan P. created this plan of the garden in 2009. Elizabeth updated it in 2012 with plot numbers and the addition of plot 25. In September 2012, the garden adopted Rhode Island Red hens. “The girls,” as they came to be known, quickly charmed the garden and the neighborhood. Since then, some of the hens have passed on and we’ve had a few new additions! Everyone is welcome to hold them and feed them greens (ask a gardener for help, or look for the signs on the coop). Certain garden members will let them out for exercise and foraging. The goldfish in our pond bring lots of visitors. Keeping the pond clear is an ongoing challenge. We have been working on a solar-powered project to filter and pump the water in the pond. 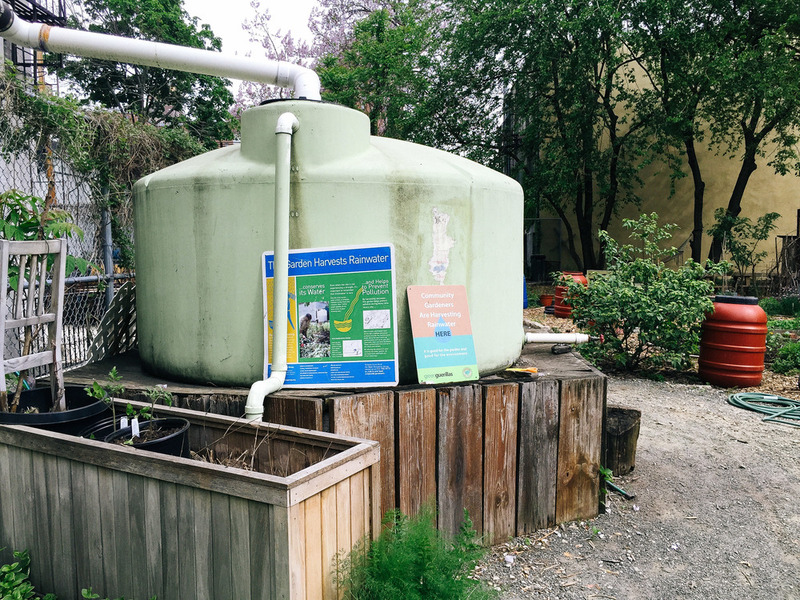 Greene Acres harvests rainwater. From the roof of the neighboring building, water flows down a three-story downspout into the water tank. We use the water for common areas and plants that will not be eaten. Diverting rain reduces flooding, and storing water reduces our reliance on water from the fire hydrant. The tea garden revitalized a neglected berm by the pond. We built and planted a garden of about 30 different herbs and medicinal plants for use in teas and infusions. Aromatic and colorful throughout the season, plants like verbena, poppy, lavender and hyssop draw in passersby, and all are welcome to enjoy their benefits.